Despite his reputation as a major figure in the central desert art movement Willy Tjungurrayi (AKA Tjungurayi) did not move to Papunya from his birthplace, Patjanta, until his late 30’s, several years after Geoff Bardon had departed the community. Having grown up in the bush, it was not until the mid 1980’s after exposure to western culture for some time, that he began creating paintings, which married individual artistic expression with ceremonial visual traditions. His early works were more cartographically detailed and ethnographically specific than those with which we have become so familiar today. They depicted the sites where large groups of men gathered in the formative period establishing the song cycles, ritual procedures and ceremonies that are considered secret and sacred to this day. Despite the presence of the familiar western desert iconography these early works already embodied a vibrancy that made them shimmer. Willy Tjungurrayi, and George Tjungurayi, are often presented as artists whose works are distinct poetic abstractions. This is especially so of the seemingly visceral lines of Tjungurayi’s later work of which the image illustrated above is a good example. It was created in 2006 and is a modest 58 x 118 cm. in size, yet it perfectly exemplifies his late career works in which duochrome lines float on a black background with their delicate colour transitions creating an hypnotic wavering rhythm across the canvas. Though works like this still make reference to the Tingari ancestor’s traveling over vast stretches of country, the symbolism is far less tangible than those of a number of his contemporaries. The oscillating linear white dots delineating earthy red ochre lines stand out on the black background to create a textured surface. This is heightened by the way in which the artist paints over some of the lines so that their translucence varies. The highly individual visual language makes the eye dance over glowing surfaces that appear to be in perpetual motion, and in doing so, is used to convey Tjungurrayi’s own unique vision of the landscape through which the Tingari traveled. Willy Tjungurrayi’s paintings have been exhibited and collected widely in Australia and overseas. While his 1980’s works have fallen out of favour along with those of many of his male counterparts in the central and eastern deserts, his more individually distinct works of the last decade have played an important part in fuelling the growing market aesthetic for more abstracted contemporary Aboriginal painting. Despite a career spanning 30 years, relatively few of Willy Tjungurrayi’s works have been offered on the secondary market. Only 40 have sold despite his towering presence in the primary market during the last five years. The book Papunya Tula-Genius and Genesis published in 2000, which is held largely responsible for the recent success of Papunya Tula art in the market, featured only one work by this artist along with several large men’s works on which he collaborated. His one solo work was a large Tingari image painted in his mid 1980’s style that today seems dated in comparison to his later works. The omission of more recent work was clearly due to the fact that by this time the artist was already painting for a number of independent dealers in Alice Springs, most notably Chris Simon (Yanda Art) and Tony Mason, for whom many of his best works of this later period have been painted. 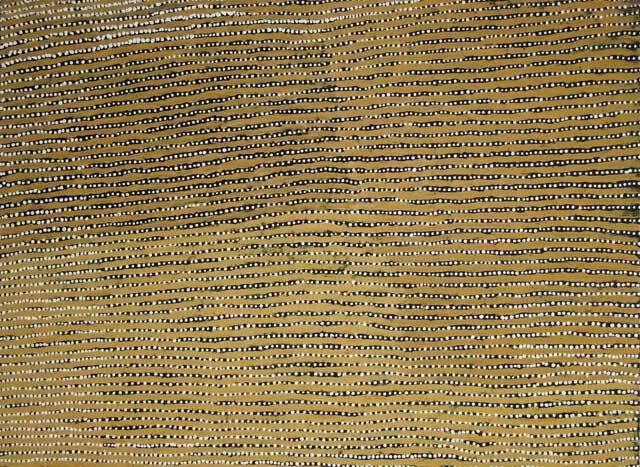 There is little doubt that Papunya Tula provenanced works will continue to sell for a premium in the short to medium term, as evidenced by the record price paid Hail-Storm at Kaakuratintja 2002, sold in 2005 for $59,250. There has been a clear preference for paintings by this artist produced since 2000, along with those created prior to 1982, with his record price falling in the former and the second highest in the latter. Of works painted between 1983 and 1999 just 10 have sold at very modest prices while 11 have been passed in. Amongst these have been major works with excellent provenance principally painted in the more generic Tingari men’s style that was prevalent throughout the 1980’s. During the last 5 years Willy Tjungurrayi has produced a number of masterpieces both for Papunya Tula and for independent dealers. These latter works sell in the primary market for prices equal to, or better than, his best results so far at auction. It is likely that these will be considered his masterworks in the future and that the original source provenance will become less important than the impact and quality of the painting itself, as time progresses.